Here’s a fun game: every time you hear the world “girl” in a song, replace it with “squirrel”. It’s cute and fun at first, but then you start to automatically do it. Beck is actually singing about a sun-eyed squirrel, Van Morrison notices the color of a rodent’s eyes, Nirvana is telling you a story about a squirrel. It’s cute and fun at, but pretty soon you can’t stop. There are squirrels everywhere, coming outta nowhere! It’s fuzzy rodent madness! Actually, maybe you shouldn’t play that game. Instead, because I am way too deep in this insanity, read some nifty words about that thing I just cannot get out of my head! Squirrel Girl to the rescue! Now, most people probably thought how ridiculous of a character Doreen Green is when they first hear about her. That’s partially what makes her so great. 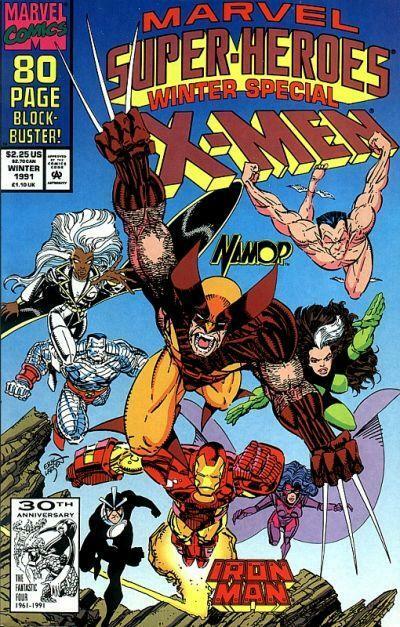 I mean, Marvel even said that a Squirrel Girl 2099 title was “one of the books we’ve pretty much ruled out”. Ouch. 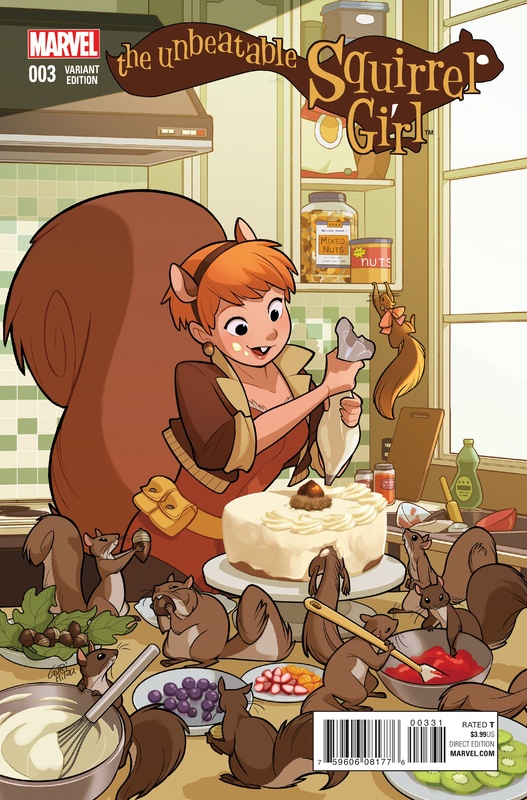 This adorable critter made her first appearance in “The Coming of … Squirrel Girl” in Marvel Super Heroes vol. 2, #8 in the shivery winter of 1991. Ah, good year. She was created by Will Murray and Steve Ditko, purely for the sake of comic relief. Murray has stated that he wanted to get away from the drama and seriousness of the X-Men titles, and bring back the fun and joy of comics. Obviously, that he did. We meet Doreen, an awkward girl with squirrel mutations, trying to escape the taunting of her fellow Los Angeles school classmates by running into the nearby woods. There she discovers her fellowship with squirrels, obviously. She adopts the costume and concept of Squirrel Girl, and soon meets one of her heroes, Iron Man. He gets captured by his enemy, Doctor Doom, but Dorren saves him single-handedly with the help of her fuzzy friends. After all that, he declines her offer for a partnership. Kinda ungrateful, don’t you think? We don’t see much of Squirrel Girl after that. She appeared in little things, not making an impact until almost a decade later in 2005 with the miniseries Great Lake Avengers, a team of light-hearted heroes with pretty useless superpowers and odd abilities. The funny thing about Squirrel Girl is that she has a great amount of victories that are never really talked about. My favorite is her kicking the living Jello-O out of Deadpool, because he had it coming. And it’s Deadpool. 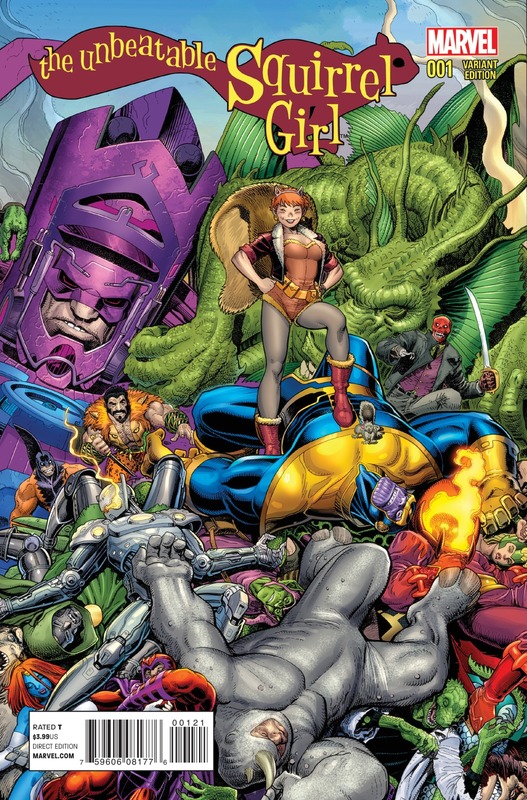 She also defeated Wolverine, M.O.D.O.K., Thanos. That’s right, Thanos. Defeated by a girl and her squirrels. Though she did not technically defeat Galactus, she has saved the world from him by befriending him and convincing him not to, you know, blow everyone to pieces. But really, what is a hero without her sidekick? Monkey Joe was her OG sidekick, making his first appearance at the same time she had hers. He helped her defeat Doctor Doom and save Iron Man, and unfortunately met his demise by Leather Boy disguised as Doctor Doom during Great Lakes Avengers. After his death, Doreen’s next sidekick was a female squirrel named Tippy-Toe, complete with a cute pink bow around her neck. Her greatest moment was helping to defeat M.O.D.O.K. and Thanos. Though not as intelligent as Monkey Joe, Tippy-Toe is a fiercely loyal companion. 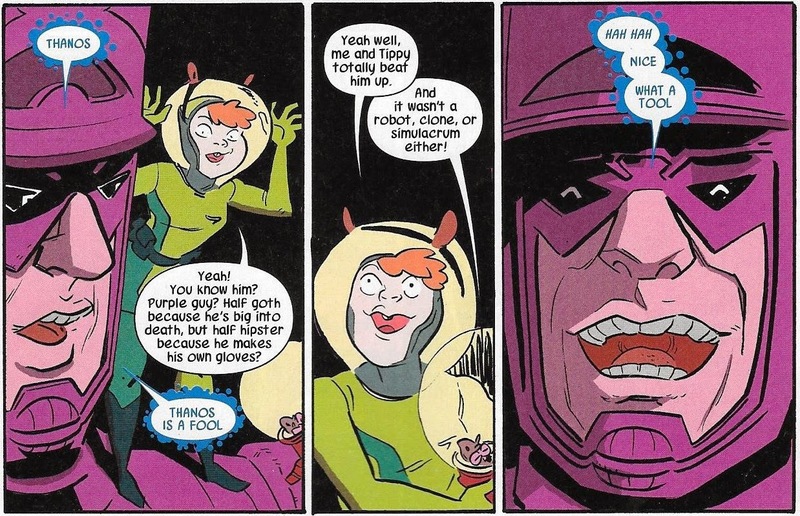 Squirrel Girl is not only an immense form of comic relief, she’s the true definition of a hero. She may be silly at first glance, but she has some extremely courageous qualities that are often overshadowed by a giant tale and oversized teeth. With so many female comic book characters oversexualized and draw like something from an X-rated website, Doreen Green stands apart from that. This is a world where you can create almost anything, and she is the complete package when it comes to creativity. Bravery doesn’t always wear a cape, sometimes it adorns a huge heart….and giant squirrel tail. Great article. Not a fan of the art but sounds like a fun read. I have done really well with SG’s first app. I found one in the wild less than a year ago for a $1 and just last weekend found one for $3. Should have took the time to read the story before I flipped it. Anyway great piece!